This is the first guest post by Sammie (with help by Georgie!) You can follow them at The Sammie and Georgie Show on YouTube, Facebook, Twitter, and Instagram! Are you looking for a fun adventurous show? Disney Duck Tales is for you! In this show, brothers Huey, Dewey, Louie, their cousin Webby, uncle Donald and their uncle trillionaire Scrooge McDuck go on missions. Along the way they always wind up in a bad situation, but they figure out how to solve it. They have to go through tricky tasks and arguments along the way. Today on Theresa’s Reviews, you can download four activity sheets and learn about the brand new DuckTales Destination: Adventure! DVD. Download a fun activity set with four sheets! Click below to print a coloring sheet, crossword puzzle, find the differences and a maze! 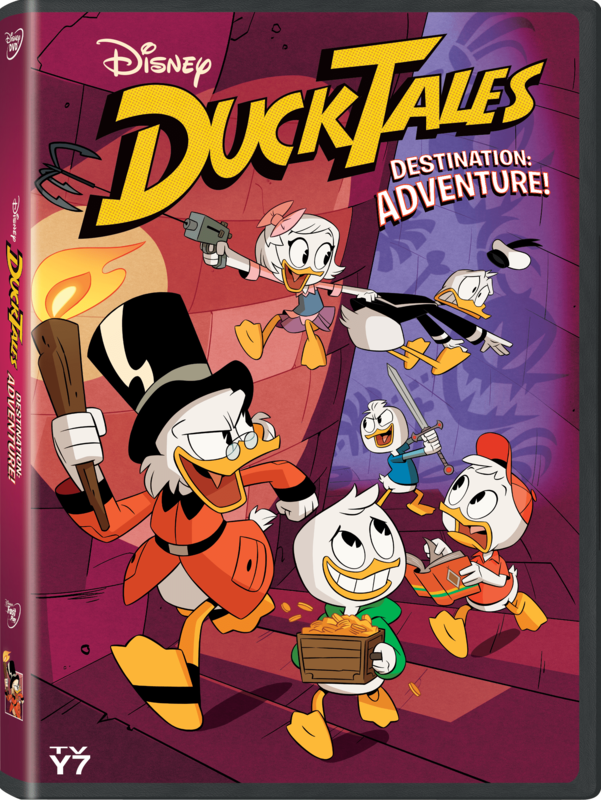 In the new DuckTales Destination: Adventure DVD, you can take your favorite episodes on the go. With six episodes and three bonus features, this DVD would help you have fun on a rainy day or when you have nothing else to do! DuckTales is always the right show for a good laugh. One of the funniest moments are when the mummies make burritos in The Living Mummies of Toth-Ra! In most episodes, Scrooge is a funny character, especially when he dives into his pile of money. Donald is the funniest because he usually gets bad luck. All of the shows have many thrilling moments. One of them is when Launchpad falls off a mountain in The Impossible Summit of Mt. Neverrest! Another is in The Beagle Birthday Breakout! when the characters sneak into the beagle birthday where all their enemies, the beagle dogs are celebrating. The characters accidentally do something that attracts everyone’s attention and ruins the party. I couldn’t wait to see what would happen next. You should watch DuckTales because it is a funny, adventurous and thrilling show that the whole family could enjoy. My dad loved watching this show when he was a child, and now I enjoy this new, updated cartoon with him too. For more Disney insider tips, follow Theresa’s Reviews on Facebook, Twitter, Instagram, Pinterest, and YouTube. If you enjoyed reading this, you should also check out Peter Pan 65th Anniversary Blu-Ray & Activity Sheets. Who is your favorite character from DuckTales? Share in the comments!